A Monroe County woman has confessed to killing her friend a year and a half ago because she "could not live with the pain any longer." Paula Ferguson went to the Monroe County Sheriff's Department on March 10 to tell invesigators that Rebecca Davis' death was not a suicide. She said on August 11, 2013, she and Davis were outside "shooting up" and "playing around" when Davis got up on a table and tied a cable around her neck beneath a big pine tree. 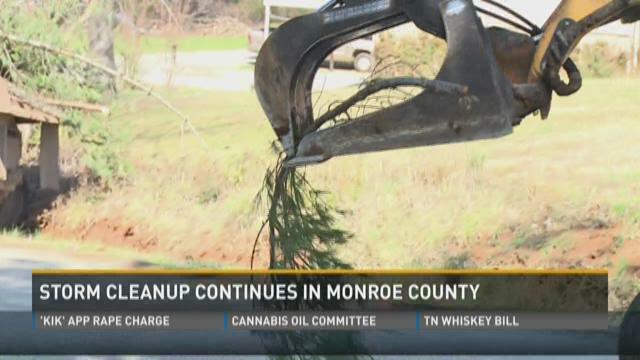 MADISONVILLE - The Monroe County Highway Department has moved more than 350 loads of debris to a nearby burn site since the February ice storm. Crews have been hard at work for more than a month and officials said cleanup could very well continue into the late summer months. A couple is charged after a traffic accident that killed one of their children and seriously injured another. On February 1, Raymond Shumate was behind the wheel on State Highway 307, when his car ran off the road and crashed into a tree. The car caught fire. Shumate's 7-year-old son, Luke, died in the crash. Another child in the car, Jake, 9 was hurt, and is still recovering in Children's Hospital. None of them were wearing seatbelts. The state is hosting a jobs fair in Vonore Wednesday. Jobs4TN's job fair is from 10 a.m. until 2 p.m. at Tellico West Conference Center. Participating employers include CVS Health, Malibu Boats, Hardee's and more. to get tips for succeeded at a job fair. Monday marks three years since 18 tornadoes touched down across the area. The outbreak included an EF-2 tornado that swept through downtown Tellico Plains, damaging or destroying dozens of homes and businesses. The National Weather Service recorded 70 confirmed tornadoes between March 2 and 3 across the South, which killed 41 people. No one died in Tennessee. Monroe County and Sweetwater schools are closed Thursday and Friday due to illness, according to the systems' spokespersons. (WBIR - Monroe County) Monroe County school officials met with hundreds of parents Thursday night to squash rumors about a school closing. There had been rumors circulating in the area that Coker Creek Elementary would be closed due to budget cuts. But Monroe County Director of Schools, Tim Blankenship, told parents that isn't true, and tried to reassure parents the school is safe.